Yes, I have pneumonia. 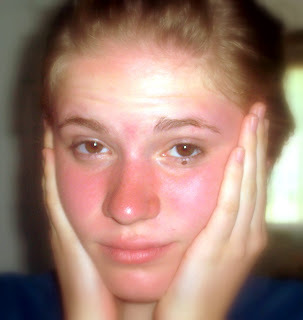 :-) My sunburn isn't that bad anymore, and I am feeling a lot better now that I have a powerful antibiotic in me. So this picture should show me looking a little more perky than this, but mom thought it looked so funny and pitiful that she said I should post it. Poor thing! Get lots of rest and feel better! Very red :). You got a lot of guts posting sick pictures of yourself. "Git bettuh, Git bettuh, Git bettuh!" PS: Are you uploading pics with Picassa or just uploading them direct in the blogger form? "Garrett,I fix them up on Picassa" (Lori: only cuz Max insists it's better than Roxio -- Kaylee agrees, I'm not so sure! )"and then I post them direct from blogger." Max is a wise man. But for the record, you can upload pics direct from Picasa. It's a real quick way to shoot a picture (or a batch) up to your blog. Max probably knows that trick too! But don't mind me, you guys do a fine job already ;).